Internships are not paid, per se. Josh McDowell Ministry, a ministry of Cru, is a support-based ministry. This means that we have no central funds for paying our missionary staff or interns. However, if you are accepted into an internship, we will train you on how to raise financial support from churches and individuals who have a heart to share the good news of Jesus Christ. We are continually looking for interns. The internship is for one year. Our usual intern report date is September 1st. The salary of a U.S. intern after taxes is approximately $1,200 per month. This includes approximately $500 for housing/rent costs. In addition, the intern must raise support for Social Security and federal taxes, health insurance, ministry expenses, and overhead. So the total is approximately $2,500/month. This will be more if conferences, summer projects, or any other predetermined costs are added. Yes. After you apply and are accepted, you will attend a weekend training, usually sometime during the month of April. The Intern Kick‐off Weekend conference will orient you to the process of raising support. After attending the conference, you have the tools needed to begin raising your support and have the next 3‐4 months to raise it. If it is time to report to your assignment, but you are not at full support, one of two things can happen. If not much support has come in, then that is probably an indicator that God is calling you to do something else. The (very few) people who do not see their support come in are still thankful for taking this step of faith and can see God’s hand in it. If you are very close to finishing, a short amount of additional time (two weeks) might be allotted for you to complete your support raising and still get to your assignment. 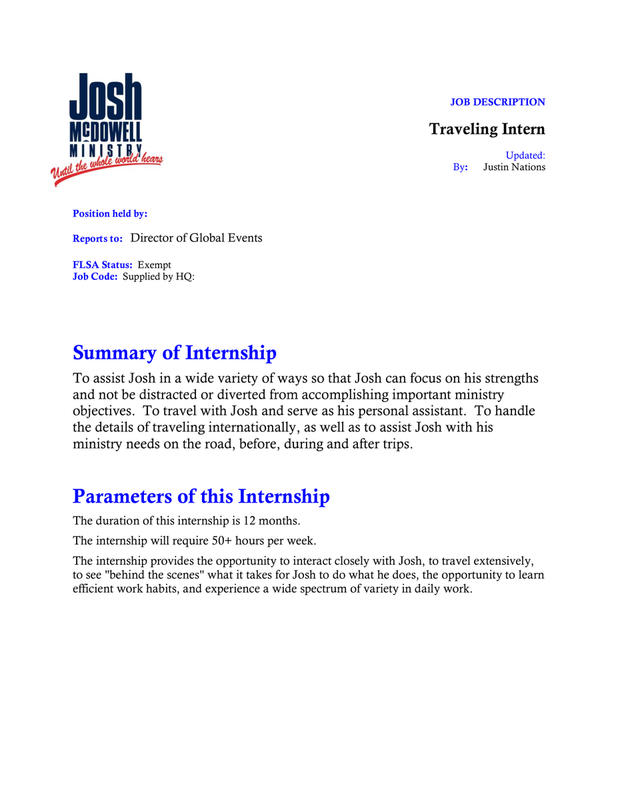 Each situation will be evaluated on an individual basis, but you must be at full support and have clearance from your Intern Coordinator in order to report to your assignment. Will I have any help or encouragement during the support raising time? Yes. At Cru, we call support raising Ministry Partner Development (MPD). During your MPD time you will be assigned a coach who will help you through the process. While this person cannot go on appointments, dial the phone, or write letters for you, he or she will give you weekly instruction and encouragement along the way. He or she will help keep you on track toward your goal of being fully funded for your internship.